Right, think it's time for us to wrap things up here but we'll be 'Baku' in two weeks time for the Azerbaijan Grand Prix. See you later! The Mercedes driver passed team-mate Valtteri Bottas, who started from pole position, off the line and controlled Formula 1's 1,000th race from there. Ferrari's Sebastian Vettel took third, after the team ordered team-mate Charles Leclerc to let him by in the opening laps. Read more from Andrew Benson here. Today's victory also marks Hamilton's 75th career victory. This was not a particularly memorable Chinese Grand Prix but the circuit has seen some classics - 2007 comes to mind when Lewis Hamilton's maiden title bid hit the rocks. The Briton had been sitting comfortably at the top of the championship in his rookie year but on his way to the pits and on tremendously worn tyres he slid into the gravel and out of the race. "I absolutely disagree with the penalty." Says Daniil Kvyat. "There was no understeer. I don't see that this incident - I have seen my on board and Lando's - was particularly deserving of a penalty... it was a sandwich, I will go and see behind closed doors with the stewards what happened." While Carlos Sainz says: "From my side it's lap one, I understand his frustrations and it can happen, but its' lap one and there's 55 to go. I think he knew we were there. It's a shame because it's a long race and you can overtake even if you don't get the best starts." Lando Norris says: "My first DNF in Formula 1... it was disappointing but it would've been nice to do another race. Not what we liked or hopped for but the only positive was looking at Carlos' pace after the incident, so the potential pace is there to hope for. It was a lonely race so I would've liked to have had a bit more fun." How many F1 facts can you remember? A landmark moment was reached his weekend as China hosted the 1,000th F1 race. From sensational wins at Silverstone and agonising defeats in Brazil to wet-weather madness at Spa - F1 has seen it all. We've put together 20 teasers from across the decades for you to find the answers to. See how many you can get right here. Pieter De Boiserie: I'm officially done with F1 no excitement at the front of the race whatsoever post start. The most exciting thing was Mercedes double stacking in the pit box. @FIAFormulaE is where its happening. Flonso14: @LewisHamilton and Seb are both false world champions. When they have a car that isn’t the fastest, they are both useless. Sara Turle: Cancer diagnosis+treatments brought me to F1. Not able to sleep, found it by chance. Immediately hooked and then something to really look forward to through dark days. 9 years later, cancer free, am still hooked. William Ogle: Ricciardo getting to 7th is probably a huge relief to him after two DNFs. Best of the rest, and I'm sure it'll push a talent like him onwards. I do hope we'll see him on the podium this year if Renault can get somehow pull something out. 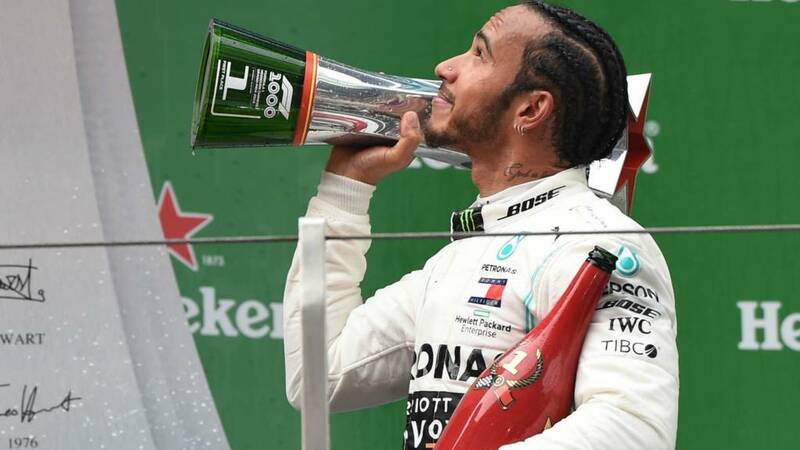 Video caption: Lewis Hamilton makes history in China winning the 1000th GP.Lewis Hamilton makes history in China winning the 1000th GP. Mattia Binotto, Ferrari's team principal says: "Mercedes have been fast all weekend, and they proved to be faster today. From one race to another the situation changes and it seems each single race is different. "We don’t have an idea as to why we can't replicate their speed but we need to get back to Marinello and look at the data. "I understand the feeling for Charles but a that point in the race Mercedes were faster and we tried to give Seb the best opportunity. It wasn’t to give one driver an advantage. "If Charles is upset he is right to be upset and we should accept it." Max Verstappen, who finished fourth says: "I think there was not much in it. I was pushing hard to stay with them. "As a team we did well to undercut a Ferrari so we maximised the result. So far every weekend has been a bit of a guess on how you are doing and what is going on. I had a good battle with Seb but after that we didn’t have the pace to fight so I settled for fourth." This weekend we asked you to vote for what you thought was F1's greatest-ever race. With 999 races there was a lot to choose from and some great races are understandably unfortunate not to make the list, but of the 10 options there was one clear winner. Find out which race you picked as the best of them all here. Pierre Gasly scored a point for the fastest lap. Stealing it in the final couple of laps from Sebastian Vettel. He says: "I'm happy to get my first fastest lap. We had a free pitstop and decided to go for it. Slowly the feeling is improving inside the car." Charles Leclerc, who finished behind Max Verstappen in P5 says: "I had a good start then it went a bit messy. I need to understand the full picture with Seb and spend some time with the engineers - there must be a good reason behind this decision. "Overall I've not been as strong as I wanted this weekend, Today was not a good day but we will come back stronger. "I need to look at the data and speak with the engineers, I don’t want to make any silly comments. If you look at my own race we pitted early, if you look at the team race we pitted at the right time to slow Mercedes down." Ahead of Formula One celebrating its 1,000th race, the 5 live F1 team sat down with the former boss of the sport Bernie Ecclestone. We hear his views and memories on a wide variety of topics from attending that first race in 1950, to what he now misses about the sport and why Ferrari need to return to winning ways. Christian Horner, Red Bull's team boss says: "I think we had a good strategy. We managed to nick a place from Ferrari - I think they were quicker but our strategy was better and Max has driven the wheels off the car. It was good to nick the fastest lap off Sebastian for Pierre. "Points mean prizes, and at the end of the year they all add up, it was a free opportunity to go for the lap time for Pierre. "I think we had a good weekend here the chassis made a good step forward Honda made progress on the straights, there's stuff in the pipeline that will help us with the sector three power with that in the near future." Robert Obonyo: Tough weekend for us guys but good work all the same. We'll be back in Baku. Kvyat cost us the weekend. F1 statster New Ferrari may be “Nice Ferrari” but it’s also “Indecisive, Trip up over ourselves, Awkward Ferrari”. Last year they made mistakes but they at least seemed to have some fire in their bellies, now it’s just the mistakes. Mercedes team boss Toto Wolff is quite happy for the third race this year. He says: "It's the 1,000th race and it's super for us to be on pole and controlling the race. The double stack (pitstop) was particular a proud moment because you have everything to lose if you're in one-two. It was good choreography. "Our pace took us by surprise even on Friday we didn’t think it was possible to control it that was I'm proud and happy for the team. The power is superior on the straights, and our car is a bit more regular than theirs. In terms of managing the tyres the downforce levels help. "You try to get out fast and not run behind we have some good stuff coming on the car and the development direction is right. You can see everyone is happy and it’s a special win. The clutch pedal was under control today for Hamilton." "Valtteri will not be happy as he was on pole, but the start was the deciding factor. Baku is a different ball game you need to get the power track level there right, we are up for the fight." Lewis Hamilton moves top of the drivers' championship with his second successive win of the season. Just three races in and the gap between himself and Sebastian Vettel is also looking pretty meaty. William Ogle: And this is why trying to predict a season based on winter testing "performance" is folly. Congratulations to Hamilton, and I think Ferrari will have a lot to think about. Phil Hambley: Hamilton has won 7.5% of every F1 race ever run. Crazy. Roxy: Do you think F1 were hoping for a bit more of a dramatic race for #race1000 Don't think we'll be reminiscing about this one at future milestones. F1 Statster: Ferrari are being way too safe and risk averse and it’s costing them. We saw it in Australia and now here, reacting to others instead of being proactive is not good enough if you want to win the world championship.